Fyodor Dostoevsky isn’t just a great writer. He’s a heroic writer. His brush with death reverberated through the rest of his life. Shackled though he was and in chains, he returned to his cell full of life at having been given back his life. He had little to celebrate in fact, for he had been sentenced to four years of penal servitude followed by service in the ranks ... His career had been ruined; lesser men might have been crushed. 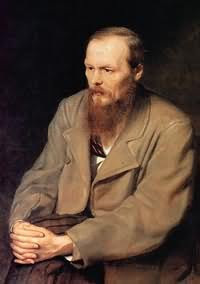 Instead Dostoevsky appeared reborn out of the disaster. As I look back on the past I think how much time I have wasted, how much of it has been lost in errors, in mistakes, in idleness, in an inability to live properly; how little I treasured it and how often I sinned against my heart and my spirit--and my heart is overwhelmed. Life is a gift, life is happiness, every minute can be a lifetime of happiness. ... Now in changing my life I am being reborn in a new form. Dear brother, I swear to you that I will not lose hope and I will keep my spirit and my heart pure! I will be born again for the better. He himself was disliked and avoided by everybody. In time they even began to hate him. Why, he did not know. Men who were far more culpable than he despised him and laughed at his crime. Dostoevsky’s crime, incidentally, was political. He was convicted of reading out this letter (from the critic Belinsky to the writer Gogol) to what was more or less a private debating society. Unfortunately, that group of liberal-minded intellectuals had been infiltrated by a government spy. He was appalled and fascinated by the evidence of evil he encountered in the criminals with whom he daily brushed shoulders. The lack of remorse encountered by the worst of them for the unspeakable crimes against children and women--not to mention the mass murderer, Orlov, who was steely and self-controlled beyond belief--directed Dostoevsky’s thoughts inevitably to crime and its psychological meaning. In all of his future major fiction he made murder the focus of his attention and criminality a central issue. If that isn’t the definition of a crime writer, I don’t know what is. Of course, Crime and Punishment is the Dostoevsky book which most explicitly concerns itself with the subject of murder (and which inspired my own new novel, The Gentle Axe). Dostoevsky’s first wife and his beloved brother, Mikhail, had both recently died within three months of each other. He took on all of his brother’s debts, as well as the journal Epoch that he and his brother had founded. With an energy that would shame even the most prolific of today’s bloggers, he worked day and night to keep the journal afloat. But in vain. Epoch folded in 1865 and the debts mounted. I can’t help wondering whether this informed his choice of murder victim in Crime and Punishment. Part of Dostoevsky’s greatness is his understanding of human frailty, as well as criminality. The character of the drunkard Marmeladov in Crime and Punishment is evidence of this. Dostoevsky himself suffered from an equally damaging addiction: gambling. One of the wildest gambles he ever played took place around this time. He entered into an agreement with a rather dodgy publisher called Stellovsky. For a promised advance of 3,000 rubles he undertook to deliver a new novel by the end of November 1866. If he failed to deliver, he would forfeit the rights--and all payment--on anything he might write for the next nine years. Talk about a deadline! That masterpiece was of course Crime and Punishment. Significantly, Dostoevsky did not offer this to Stellovsky, thereby putting himself under pressure to write an additional book (appropriately titled The Gambler) in barely a month. With the help of his future second wife, Anna, who served as his stenographer, he just about pulled it off. I’ll take a closer look at Crime and Punishment in a future post. By the way, for anyone who’s interested, the text of Crime and Punishment is available to download for free here, here, and, in Russian, here. There is a production running of Crime and Punishment at the Round House Theater in Bethesda, Maryland, through the end of April. Free is good--but the best translations of Dostoyevsky I've seen are by Richard Pevear and Larissa Volokhonsky. Not free, but great. Hi David, yes - they are a great duo when it comes to translating D. I was just going with the online vibe, you know. I am about to play Porfiry in a stage version of Crime and Punishment, and was doing some research. Glad to see that Petrovich lives on!